Pet Policy: We welcome a maximum number of 2 pets per room, limit 50 pounds each. Pets are restricted to certain areas of the hotel. With the exception of authorized service animals, pets are not allowed inside the restaurant, fitness center, meeting rooms or the swimming pool. Advance registration of your pet is required. A pet waiver and non-refundable pet fee will be required at check-in ($50 per pet).Other restrictions, terms & conditions apply. See Details. Featuring a relaxed décor with unique outdoor views and a balcony. A lifestyle inspired room offering a custom bed wrapped in Egyptian cotton sheets. 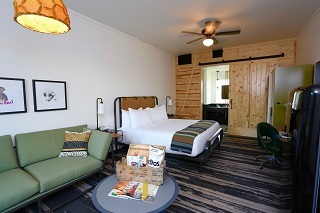 Room features include leather headboards, executive workstation, military inspired armoire, iron and ironing board, coffee maker, seating area and a retro inspired Smeg refrigerator filled with your favorite Texas snacks and drinks. Traditional sized bathroom that features a rain shower, hair dryer, Lather spa products, heavy plush terry towels, and branded bath robes. Featuring a relaxed décor with unique outdoor views and a balcony. A lifestyle inspired room offering two full size beds wrapped in Egyptian cotton sheets. 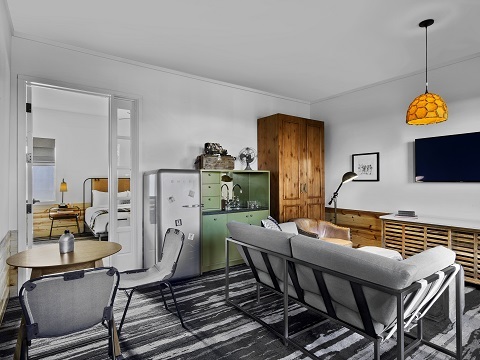 Room features include leather headboards, executive workstation, military inspired armoire, iron and ironing board, coffee maker, seating area and a retro inspired Smeg refrigerator filled with your favorite Texas snacks and drinks. Traditional sized bathroom that features a rain shower, hair dryer, Lather spa products, heavy plush terry towels, and branded bath robes. Featuring a relaxed décor with unique outdoor views of a lavish courtyard and large sweeping balconies with rocking chairs. A larger lifestyle inspired room offering a custom king bed in Egyptian cotton sheets. 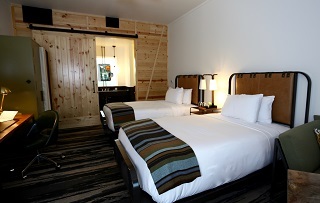 Room features include leather headboards, executive workstation, military inspired armoire, iron and ironing board, coffee maker, seating area and a retro inspired Smeg refrigerator filled with your favorite Texas snacks and drinks. Oversized bathroom that features a large rain shower, hair dryer, natural light, Lather spa products, heavy plush terry towels, and branded bath robes. Featuring a relaxed décor with unique outdoor views of a lavish courtyard and large sweeping balconies with rocking chairs. A larger lifestyle inspired room offering two full size beds wrapped in Egyptian cotton sheets. 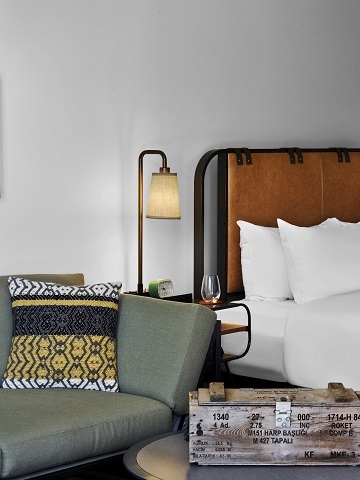 Room features include leather headboards, executive workstation, military inspired armoire, iron and ironing board, coffee maker, seating area and a retro inspired Smeg refrigerator filled with your favorite Texas snacks and drinks. Oversized bathroom that features a large rain shower, hair dryer, natural light, Lather spa products, heavy plush terry towels, and branded bath robes. Featuring a relaxed décor with unique outdoor views and a personal balcony. A lifestyle inspired room offering a custom king bed wrapped in Egyptian cotton sheets. 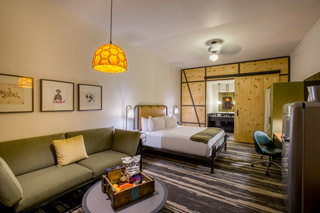 Room features include leather headboards, executive workstation, military inspired armoire, iron and ironing board, coffee maker, seating area and a retro inspired Smeg refrigerator filled with your favorite Texas snacks and drinks. Traditional sized bathroom that features a rain shower, hair dryer, Lather spa products, heavy plush terry towels, and branded bath robes. Featuring a relaxed décor with unique outdoor views and a personal balcony. A lifestyle inspired room offering two full size beds wrapped in Egyptian cotton sheets. 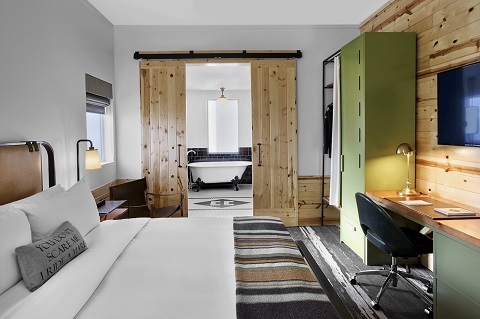 Room features include leather headboards, executive workstation, military inspired armoire, iron and ironing board, coffee maker, seating area and a retro inspired Smeg refrigerator filled with your favorite Texas snacks and drinks. Traditional sized bathroom that features a rain shower, hair dryer, Lather spa products, heavy plush terry towels, and branded bath robes. Experience College Station’s tried and true heritage. Cavalry Court features early military design incorporating rich traditions while creating comfortable gathering spaces. This room features two rooms, one large living area which includes a dining room table for 4 and a separate bedroom. 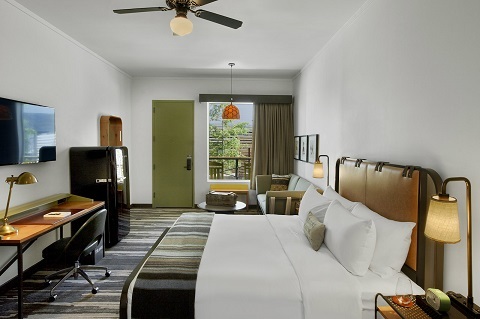 Guest room balconies open up to a vast Texas sky and wide corridors overlooking the courtyard, fire pits and pool area. Enjoy all of the modern amenities including Lather’s custom-made bath products, Egyptian cotton linens, a granite double vanity, clawfoot tub and oversized walk in shower, a working desk, in room safe, a SMEG refrigerator, and a coffeemaker with complimentary artisan coffee. Experience College Station’s tried and true heritage. Cavalry Court features early military design incorporating rich traditions while creating comfortable gathering spaces. This room features two rooms, one large living area which includes a dining room table for 4 and a separate bedroom. Guest room balconies open up to a vast Texas sky and wide corridors overlooking the courtyard, fire pits and pool area. Enjoy all of the modern amenities including Lather’s custom-made bath products, Egyptian cotton linens, a granite vanity and an oversized walk in shower, a working desk, in room safe, a SMEG refrigerator, and a coffeemaker with complimentary artisan coffee.